Looking to take your business to the next level? With Powerteam Consulting, You work with a World Class Business Coach that will help you identify opportunities for profit or increased revenue and then help you step by step to reach your business goals. Ready to get started improving your bottom line? 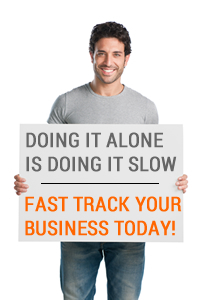 Start with our 3 step FastTrack Process. This is a series of three 20 minute calls over a 7 day period. The three steps are assessment, diagnosis and then our recommended course of action along with pricing. Would you like to join with world class Business Coaches and business consultants and be a part of a massive movement to add value and change to business all over the world? We are looking for team members with the highest skills and qualifications. How long are you willing to wait to get more sales, increased profits or a more predictable business? Are you willing to wait years or do you want to get results in a Matter of months? Look at these examples. When an aspiring entrepreneur of business professional HEARS an idea there is only a 10% chance that it will be implemented (NOT GOOD!). When there is a DECISION to act on what you need the percentage rises to 40% (NOT GOOD ENOUGH). A COMMITMENT to the action accelerates possibility that the project will get completed to 65% (BETTER, BUT IS IT WORTH ALL THIS EFFORT FOR THOSE ODDS?). When a business entrepreneur or professional has a specific ACCOUNTABILITY APPOINTMENT with a world class business coaching team or selects business coaches then the chance of your business succeeding rises to 95% (THIS SPEAKS FOR ITSELF!). One study of a Fortune 500 company showed companies who invested in executive business coaching received an average return of $7.90 for every $1 invested. So, take the next step and investigate what a world-class business coaching team can do for your business. Join the select group of Powerteam business coaches, and grow your business dramatically today! When you’re running a content-based membership website or posting content online to build you brand, one of the first things you’re going to have to decide is the format of the content. Will it just be text? Will it be audio, in the form of recordings or interviews? Or will it be a video of you talking? The two most important things to evaluate for each choice are its ease of production and its perceived value. Ease of Production What should you consider when you’re trying to gauge how easy or hard the content is going to be to produce? Building a responsive list is one of the most powerful tools available to entrepreneurs who want to get paying subscribers to a membership website. It can help you get new customers, keep old customers on longer and even make money from non-subscribers. Here’s how to use list building to generate monthly income. Increase Subscriptions to Recurring Billing Products It’s a lot harder to get someone to agree to be billed once than it is to get someone to agree to be billed again and again, indefinitely. This is especially true if they’re only hearing about you for the first time.